A declining species in western Europe, it is usually fairly common where it occurs. It likes clearings in forests where it glides above the grass and low plants alighting to feed frequently on flowers. It also flies in the Rila Mts of Bulgaria, somewhat isolated from its central and northern European range. 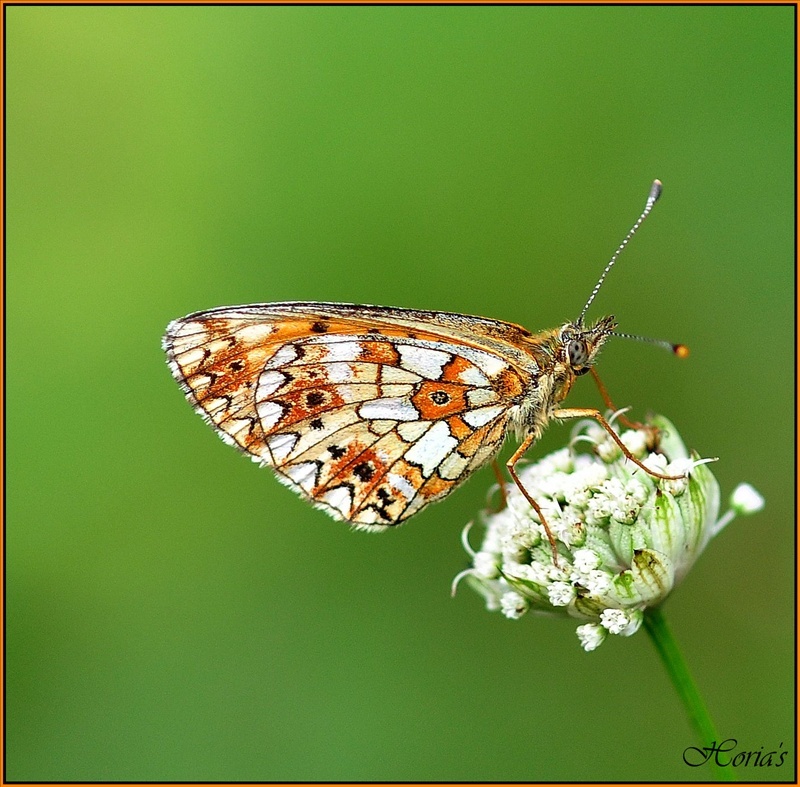 The Pearl Bordered Fritillary, C. euphrosyne, is a close relative with which it often flies. That butterfly is usually slightly earlier on the wing at the end of April, May with this species beginning to appear in mid-May. * euphrosyne has a rather washed-out rose tinted appearance whereas selene is rather bold with relatively strong red and yellow markings. * in the basal area there is a black spot that in euprhosyne is small, round and surrounded by a yellow annulus. In selene this is relatively large, is often irregular (i.e. not round) and lacks a distinct yellow annulus. * the submarginal spots are solid black in selene, those of euphrosyne are reddish. * the post discal band has a single pearly white post cellular rectangular patch in euphrosyne which is notable for its boldness against the washed out appearance. In selene there are more pearly patches near the costa and inner margin which, with the generally bold appearance, lessens the impact of the post cellular pearly rectangle. The sharpness and POV are wonderful in your shot with nice natural colors. The blurry BG is great. What a beauty! The butterfly and the photo as a whole. Everything is so good and beautiful. No critique at all. Superb! This is an excellent capture of Clossiana selene taken from a great POV to show the closed wings with excellent sharpness against a pleasing natural BG. due to excellent sharpness and the smooth and nicely contrasting background. great focus and colors, a bit central composition? fine capture of the butterfly, lovely colours, sharp image with good details, excellent dof, lovely bg. Simple nice composition. Very good light, perfect saturated colours, smooth BG. Excellent shot of this Small Pearl-bordered Fritillary. Superb OOF background provides the contrast to highlight the butterfly perfectly. Stunning sharpness and details. Foarte frumos fotografiat acest fluturas: imi place foarte mult claritatea detaliilor de pe aripi, capul si ochii. Iar bg il pune in evidenta si mai bine; O treaba foarte bine facuta! For all the heavens! this is the perfect background that I saw today in a picture! ... excellent, diffuse, homogeneous, perfect! ... Further sharpness and the light of the insect in the foreground are superb, the details are well made. It is a photo competition! goes straight to my favorite! congratulations. Thank you for that picture of Clossiana selene. It is a wonderful photography in a good composition which is very dynamic. The sharpness is very good, so that we are able to perceive many details from the butterfly. The colors are very luminous and brillant. The background is very artistic. We have the feeling of emergence of the flower, then, of the butterfly, from the background. Nice picture - Well done. See you soon on treknature for other pictures. Bardzo ładny motyl i kompozycja, może trochę jest za dużo kontrastu lub saturacji. Pozatym wszystko bardzo ładne. hello Horia . o imagine f buna, pozitie buna fata de subiect , background blur. eu zic ca imaginea asta este una din cele mai bune cu fluturi care le-am vazut la romani pe TN in ultimile luni. mi-am permis sa fac un workshop pt ca mi s-a parut culoarea verde cam puternica dar si niste chestii mai minore. vey nice colour and clear background, cong. Foarte frumos macro-ul tau aici! Sunt de acord cu cuvintele frumoase a multor alti membrii despre calitatile fotogafiei. Detaliile sunt int-adevar foarte clare iar fundalul perfect uniform e extraordinar. Expunerea e corecta, dar personal as fi scimbat un pic ceva la compozitie: as fi lasat poate o idee mai mult loc in drapta (in fata fluturelui) si as fi taiat un pic din stanga. Desigur, aici tu stii cel mai bine daca ai acut alte elemente in fotogafia initiala, elemente care au trebuit scoase, sau nu. Oricum e o imagine foarte buna. what a wonderful picture of Boloria euphrosyne taken from an excellent POV, very good sharpness and beautiful colours, very well composed with the nice pose of the butterfly on the flower against a marvellous OOF BG. Thank you of your comment about my picture. I love the clarity and simplicity of this macro, Horia! Very well seena nd framed! Excellent shot! The dof and the colours of the bg are charming. Also the main subject is sharply focussed. Thanks for sharing. what a photo? suberp POV ,superb colours, superb blurred BG, superb quality details, sweetly butterfly..